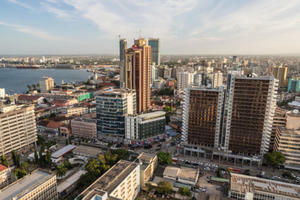 DAR ES SALAAM -- According to the Minister for Finance and Planning, Philip Mpango, emphasis in 2018 and further will be focused on construction and rehabilitation of infrastructure including airports, railways, roads, bridges and ports. He said approx. 5.3 billion U.S. dollars for the upcoming 2018 fiscal year, have been allocated for implementation of the outlined development plan and projects. The Government of Tanzania today outlined five priority areas and development projects for the financial year 2018, shifting focus towards the construction of industries in order to reignite economic progress. Presenting the economic survey report for 2017 and the national development plan for 2018 in parliament, the Minister for Finance and Planning, Philip Mpango, said the plan will also focus on creating an enabling environment for doing business in Tanzania and human resource development. Philip Mpango, the Hon' Minister for Finance and Planning said that the focus is on creating an environment that enables doing business in Tanzania and develop human resource capabilities. While presenting the economic survey report for the previous year and the national development plan for 2018 in the parliament he said that about 5.3 billion U.S. dollars(12 trillion Tanzanian shillings) has been allocated for the implementation of the projects outlined in the development plan, which is equivalent to 37% of the total budget for the upcoming 2018 fiscal year. Sources indicated that the amount of 9.8 trillion shillings will be sourced locally while 2.1 trillion will come from foreign sources. Mr. Mpango also stated that the utilization of locally available agricultural raw materials, minerals and natural gas to establish industries will be the govenrments core objective. Creating an enabling environment for doing business will be ensured and subsequent emphasis will be focused on construction and rehabilitation of infrastructure including airports, railways, roads, bridges and ports.